Mons Maraldi is a 1.3-kilometer-tall mountain on the Moon at 20.3° N, 35.3°E, covering an area about 15 kilometers in diameter. 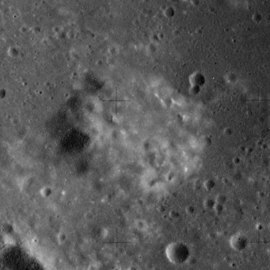 It is named after the nearby crater Maraldi. Context image showing the dome-like Mons Maraldi at center and the flooded crater Maraldi to the southwest from Apollo 17. NASA photo. ^ "Mons Maraldi". Gazetteer of Planetary Nomenclature. USGS Astrogeology Research Program. Wood, Chuck (August 16, 2006). "A Mountain or a Molehill". Lunar Photo of the Day. Archived from the original on June 14, 2011. Wood, Chuck (May 24, 2006). "Mons of Mystery". Lunar Photo of the Day. Archived from the original on June 14, 2011.